Hasta Muerte's building is for sale. After gaining national attention for not serving uniformed police officers, Oakland’s Hasta Muerte Coffee is now under threat of displacement. The building they currently lease from was put on the market about two months ago, just four months after Hasta Muerte opened for business. Located at 2701 Fruitvale Ave., the mixed-use building includes the worker-run coffee shop downstairs and two low-income residential units upstairs. The coffee collective has launched a GoFundMe fundraising campaign in hopes of buying it. The building is listed at $960,000 on Redfin, and there's an offer that's currently pending. But there’s a catch: in the lease between Hasta Muerte and the building owner, there is a right of first refusal clause, meaning the collective has a chance to match the highest bid if the building went up for sale, according to the collective. In the East Bay, many restaurants have had to close or move due to leases doubling or more. While the coffee shop still has over a year left on their lease, they see this as an opportunity to stay in the neighborhood long-term — which is their hope — while keeping the upstairs units for low-income residents, who are on month-to-month leases. 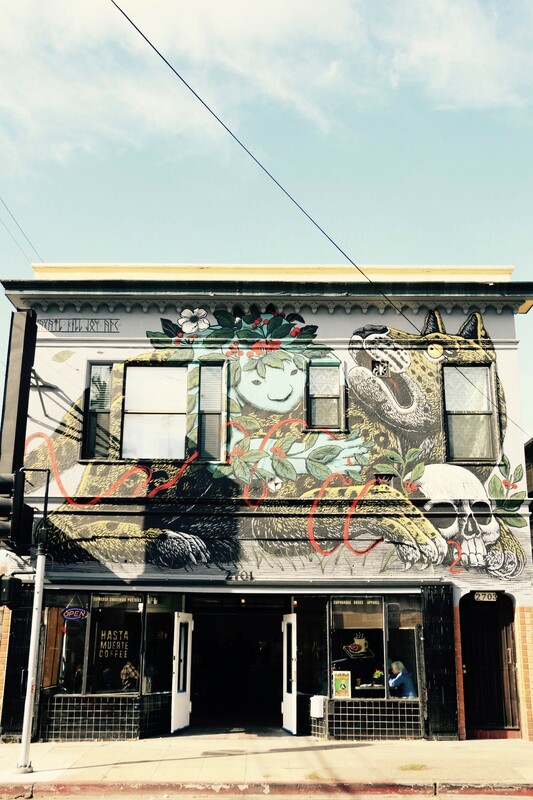 Located in a residential neighborhood in the Fruitvale district, the corner cafe is easily spotted by its bright murals — one side was done by 67 Sueños, while the other was a collaboration between artists Mazatl and Killjoy. They roast their own beans, serve a mean latte, host community events, and are committed to providing a family-friendly space. Hasta Muerte came under scrutiny in March — complete with pro-Trump protesters — when media caught wind of their policy to not serve uniformed police officers in an effort to keep the cafe a sanctuary space for people of color, low-income residents, and immigrants. The crowdfunding campaign was launched May 24 and has raised a little over $10,000 toward their $75,000 goal. They have until June 8 to match the offer. Aside from the money raised from crowdfunding, they are working to secure loans. Hasta Muerte has teamed up with the Oakland Community Land Trust, so the nonprofit would be the initial buyer and eventually transfer the building to the collective. The trust would still keep the land that the building sits on for 99 years to prevent the building from being sold at market rate in the near future, which would also ensure the upstairs units continue to be for low-income residents.